Knowledge of habitat use by animals within urban-riparian corridors during the breeding season is important for conservation, yet remains understudied. 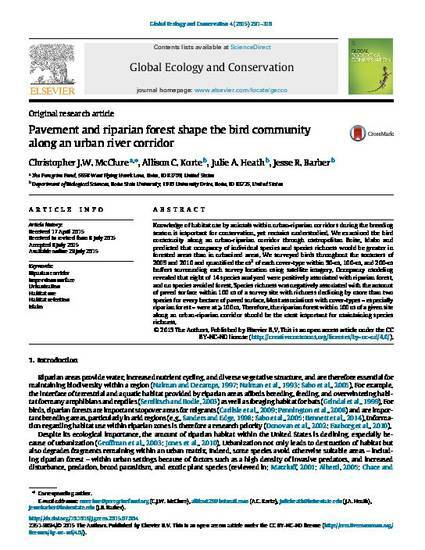 We examined the bird community along an urban-riparian corridor through metropolitan Boise, Idaho and predicted that occupancy of individual species and species richness would be greater in forested areas than in urbanized areas. We surveyed birds throughout the summers of 2009 and 2010 and quantified the m2 of each cover-type within 50-m, 100-m, and 200-m buffers surrounding each survey location using satellite imagery. Occupancy modeling revealed that eight of 14 species analyzed were positively associated with riparian forest, and no species avoided forest. Species richness was negatively associated with the amount of paved surface within 100 m of a survey site with richness declining by more than two species for every hectare of paved surface. Most associations with cover-types ‒ especially riparian forest ‒ were at ≥ 100 m. Therefore, the riparian forest within 100 m of a given site along an urban-riparian corridor should be the most important for maintaining species richness. This document was originally published in Global Ecology and Conservation by Elsevier. This work is provided under a Creative Commons Attribution-NonCommercial-NoDerivatives 4.0 International license. Details regarding the use of this work can be found at: http://creativecommons.org/licenses/by-nc-nd/4.0/. doi: http://dx.doi.org/10.1016/j.gecco.2015.07.004.